After spending a nice day with my children and grandchildren along US Highway 89 north of Great Falls, it was time to begin the long trip back to Kentucky the next day. I would begin the return trip with a quick jaunt south on I-15 to Great Falls and then south on US 87/89 towards Kings Hill Pass on the Kings Hill Scenic Byway, which runs along US 89 from the US 87 junction to the US 12 junction just north of White Sulphur Springs, Montana. Before moving on, I should mention that on the previous day we made a quick stop in Conrad, Montana to see if there is anything interesting there. Conrad is south of Shelby and just off of I-15, so it is easy off and easy on. Conrad is just a bit smaller than Shelby. Not too much, but they still have a nice looking old theater and an old 70s style motel. A nice stop for the nostalgic-minded. Since it was early morning, I didn’t stop in Conrad on the way to Great Falls. Rather, I was in town before sunrise and on to US 89 south, which joins with US 87. I had to head east through town past Malmstrom Air Force Base just as the sun came up. It was a beautiful Montana morning. US 87/89 passes by Belt, Montana, but I didn’t drive through there on this trip as I wanted to get down US 89 and into Yellowstone and US 212 over Beartooth Pass. Just shortly after passing by Belt, US 87 continues east and US 89 breaks off southward toward Monarch, Montana and pretty much follows Belt Creek, which at the time I was driving the route, was a raging creek with all of the winter runoff in full force. This is the beginning of the Kings Hill Scenic Byway. I reached Monarch, Montana at about 7:30 AM. Monarch was originally established to service the silver mines in the area. It is near the Sluice Boxes State Park. The drive through the Lewis and Clark National Forest is very nice on a spring morning. Wildlife was in abundance and the raging Belt Creek could be heard, the smell of pine in the air. It was very refreshing (with the car windows down of course!) Soon enough, I was passing through the town of Neihart. Neihart had a few unique things so it was well worth a short stop for a look/see. From Neihart, US 89 begins to offer a spectacular drive through the Rocky Mountains and gets you up to Kings Hill Pass which hits an altitude of 7,385 feet. Kings Hill Pass is part of the Kings Hill Scenic Byway which passes through the Little Belt Mountains in the Lewis and Clark National Forest in Montana, United States. I saw numerous snow runoff formed waterfalls that fed into the raging Belt Creek. This was one of the nice ones. Most of the drive on US 89 south of Neihart is in the pine forests. As the altitude climbed I could see that there were ski resorts and then I came across the Showdown, Montana sign near the summit of Kings Hill Pass. Created in 1936 and originally called King’s Hill Ski Area, Showdown is a small-scale ski area that caters mainly to weekend skiers. It also has nice summer activities for bikers, hikers and campers. From Kings Hill Pass US 89 heads down hill towards White Sulphur Springs, Montana. The end of the Kings Hill Scenic byway is about 3 miles north of White Sulphur Springs, which sits at the base of three mountain ranges. A truly beautiful setting. From White Sulphur Springs US 89 continues south towards Livingston. This portion of the drive has some spectacular mountain views, especially of the Crazy Mountains (also known as the Crazies). I can envision the awe of pioneers as they realized they would have to get past them. Wyoming lays claim to being the pronghorn capital of the world, but Montana has to be a close second. Some of my best pronghorn photos have come in Montana. I saw a small group by the road near Wilsall and stopped for a visit. From the Wilsall area I continued south towards Livingston, Montana. The mountains scenes were breathtaking on this section of US 89 near Wilsall. I knew that on the other side of the mountains sits the city of Bozeman, where I lived from 1971-1973. I loved Bozeman. Wilsall, along with Clyde Park, is in the Shields River Valley. The Shields River was named by Captain William Clark of the Lewis and Clark Expedition in honor of John Shields when they arrived here in July 1806. This area was also visited by the famous trapper, trader and scout Jim Bridger in the 1860s. Bank Bar in Wilsall, MT. Old neon and a question…is there a drive thru ATM at this bank? And of course, I finally found a nice wall mural on this trip. This one on the side of the Mercantile building takes you back to the early 1900s in Wilsall. This was painted by Gary Kerby, the same artist that made the pioneer sculpture pictured above. Gary is a resident of Wilsall. Kerby has painted murals in Montana (I saw another of his works in Cut Bank last year), Oregon and Washington. Continuing south on US 89, there are miles of open range ranchlands with the amazing mountains in the background. The mountains tower over the city of Livingston. 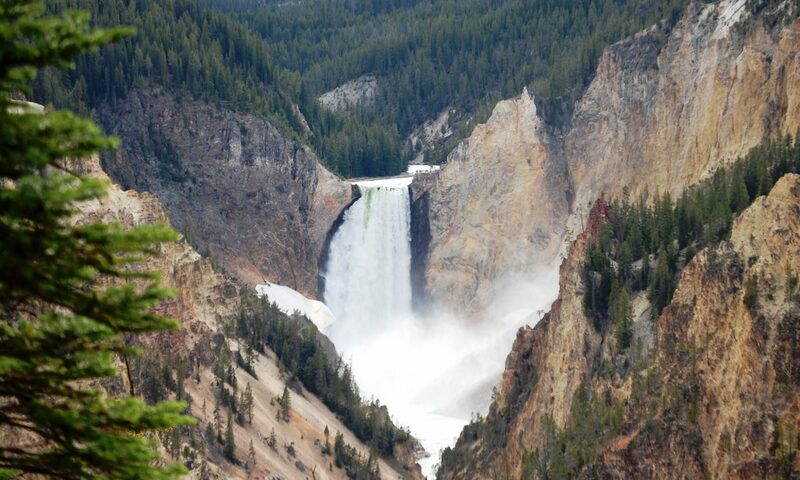 After a breather in Livingston it was on to Yellowstone National Park via US 89. From Livingston, the highway basically follows the Yellowstone River, which was running very heavy due to runoff from the mountains. The mountain scenery at this point is amazing. Not too far south of Livingston I came across a small wayside chapel with a splendid view of the Yellowstone River and Emigrant Peak (10,915 feet) of the Absaroka Mountain Range. The chapel was built in 1968 and had once sat on a small hilltop overlooking Yellowstone River adjacent to the rest area on US Hwy 89. It’s been a landmark as well as a curiosity. The chapel is always open providing shelter and a resting place for weary travelers. The chapel is 12 foot tall including its steeple; the building is 10-by-14 foot with stained glass side windows. There are eight wooden seats facing a white cross on the pulpit. And thus ends my journey on Montana’s US as I enter through the Roosevelt Arch into Yellowstone National Park and eventually into Wyoming. From this point I entered Wyoming on my way to Mammoth Hot Springs and US 212 which will take me across the northern section of Yellowstone National Park and into the Beartooth Mountain Range. That will be the subject of my next post!